The Occupy protests, the mass movement of the ninety-nine percenters rallying against the endemic greed and exploitation of the other 1%, has been underway for months. From Wall Street to Oakland and beyond, the Occupy movement has been gaining traction and attention, and may be a historical moment that demands the critical eye of the gaming community. 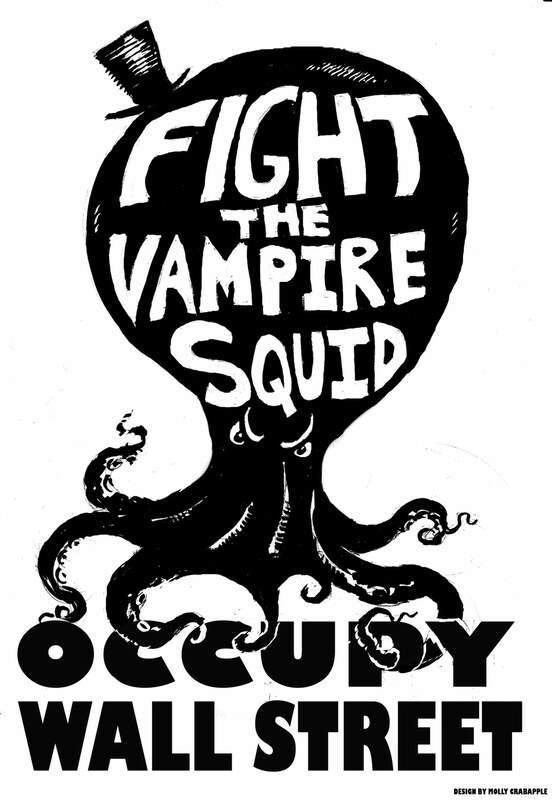 Where then are the serious (or humorous) games about the Occupy movement? Several games appeared in response to the revolution in Libya, not all tasteful, and the WikiLeaks affairs also resulted in a variety of interesting games, yet none have yet stepped forward to immortalize the relatively leaderless movement in the digital space. There are systems at work in the Occupy movement, and all games are systems. The following are several aspects of the Occupy movement that just might spark the interest of creative indie game designers out there. As Occupy sites across the nation, state and local governments have admonished protesters over ostensible health and safety concerns, going so far as to threaten and carry out the forced removal of campers. Clever activists in Wall St. and elsewhere have offered to monitor and maintain the health and safety of their own, establishing committee’s to manage trash disposal and cleanliness issues, distribute potable food and water, organize tent arrangements and more. This level of protest management requires administrative skills and know-how well above the exploits of Farmville. You think harvesting tomatoes is difficult? Try distributing a limited supply of coffee to an army of snow-laden protesters eager for caffeine. What about handling and dispersing the influx of donations from across the nation to an ever changing band of activist squatters with a variety of needs and desires. If Sim City can model a system of political and economic restraints, then Sim Zucotti Park can model an even more unique structure of democratic camp management. “What do we want! ?” According to plenty of news outlets, the Occupy activists do not know or cannot agree. Of course this is a dramatic oversimplification of a more nuanced context. Quite a few activists agree about plenty of actual policies and plans government officials could enact - ranging from job relief efforts to the dissolution of banks "too big to fail." Alternatively, others veer away from demands and prefer to express a general form of antagonism toward structures of oppression, corporate and otherwise. Professor Layton has a grand time solving the riddles of townsfolk, exploring the cast of characters at Occupy Wall St. could offer eve more insight and entertaining conversations. Understanding a collection variable narratives requires some work, but could be quite rewarding for players. Exploring the values and beliefs of protesters can feel like detective work, which could work perfectly in game - extra points for locating counter-dominant narratives that illuminate the level of discussion beyond news clip rabble. These games need not glorify the movement either. I would be interested to see games explore issues of inclusivity and disagreements. There are many interesting stories with which to interact. The Occupy movement is active well beyond Wall St. Perhaps to the surprise of pundits and protesters alike, Occupy actions have cropped up in major cities across the nation, almost spontaneously. Anyone who has worked in the non-profit sector knows how laborious it can be to wrangle a diverse group of people together for a one day event. How has the Occupy movement sustained such numbers, even in the face of sometimes violent action against participants? Large scale analysis of the Occupy protests from a state, national, and global level could prove both entertaining and educational. In a digital system, we could test hypotheses about resource investment, the spread of popular protests, and public reactions to changing contexts. Could you maximum your protest score by allocating enough resources to the right locations? Could you adapt a national movement according to law enforcement actions and weather conditions to create a persuasive force? There are large scale systems at work with every major movement, and now is a great time to explore these political and social systems at play. These are just a few ideas of interesting aspects of the Occupy protests that could inhabit the digital games space. There are, of course, many more options available. You could make an allegorical game - I would happily fight an octopus with a top-hat. Also, protests and marches might lend themselves well to game treatment, particularly when facing police forces. Of course game designers must always navigate carefully serious issues such as these. Make corralling protesters too much fun, you might get across precisely the wrong idea. That being said, the Occupy movement is the political zeitgeist of the moment and certainly deserves the attention of “serious games” developers. For now I will occupy this little corner of the internet, eager to see what you all create.